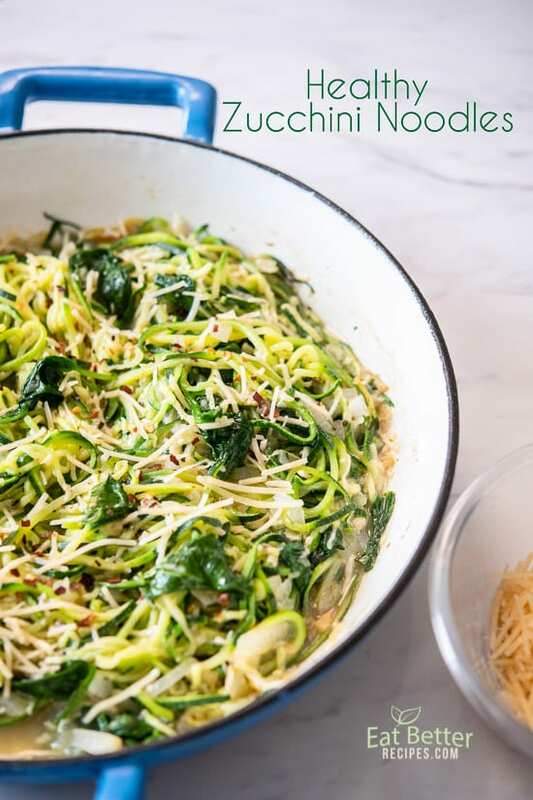 Zucchini noodles are one of our favorite dinners because they’re low carb and always satisfying. 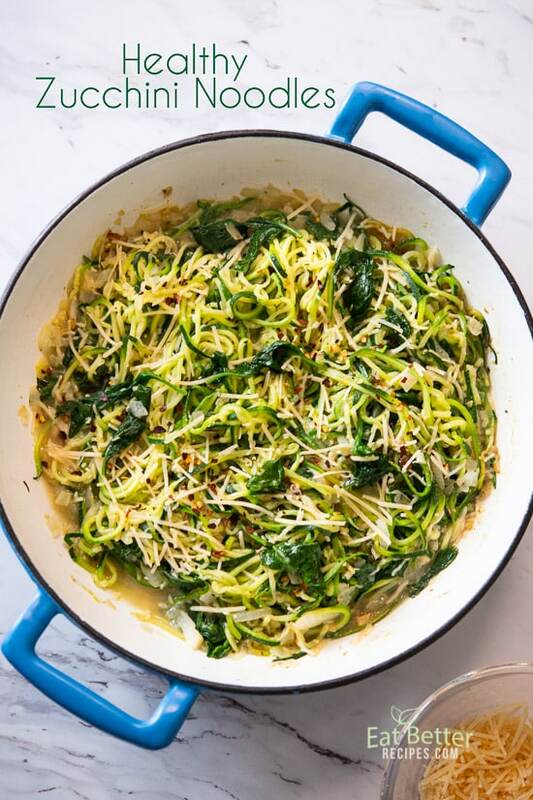 Instead of eating high carb wheat pasta, replace it with low carb zucchini noodles. You’ll soon realize that you won’t miss all the carbs from regular pasta. What you’ll enjoy is a fantastic healthy “pasta” dinner that’s really all strands of healthy zucchini. 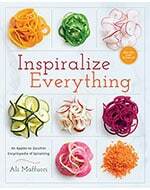 Spiralized zucchini is fantastic and you’ll be hooked on heating healthier and lower carb. 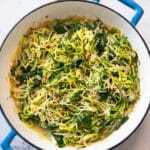 Within minutes, you can have a fantastic healthy dinner with zucchini noodles. This recipe is so flexible too. You can add what ever proteins you want and even some tomato sauce makes it taste like awesome spaghetti. Actually, it’s a healthier spaghetti alternative! You won’t be bored with this recipe for zucchini noodles. Make it your own and you’ll have limited possibilities! 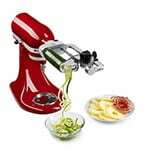 We’ve tested so many different spiralizers and tried different methods of making zucchini noodles. Most are great and some are obviously easier and have become our favorites. But we found that even our least favorite tools, still spirialize great and if it gets you to eat more veggies then we’re all for healthier eating! Some tools definitely are faster and that’s handy when you need to make bigger batches. Quicker comes with a few more issues like having to wash blades that can be super sharp. So you have to be careful! 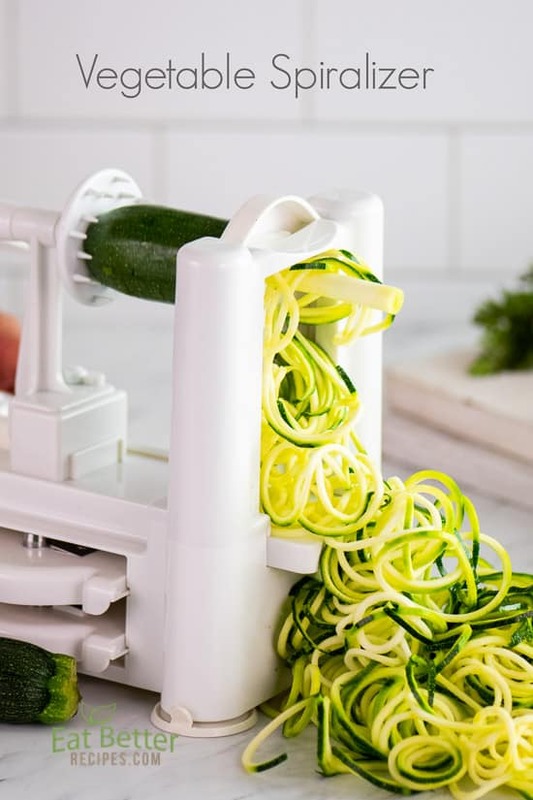 OUR GO-TO VEGETABLE SLICER IS THE PADERNO SPIRALIZER. There’s various options based on how many blades you want. The paderno spiralizes quick and efficiently, giving you some really cool different spirialize styles for different types of vegetables. 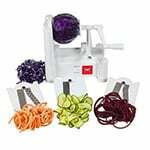 THE QUICKEST AND STRONGEST SPIRALIZER TOOLTHAT WE LOVE IS THE KITCHENAID SPIRALIZER ATTACHMENT. 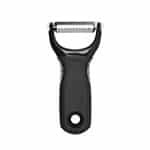 THE MOST SIMPLE TOOL IS A HAND JULIENNE PEELER. 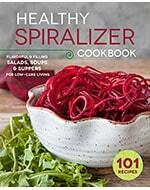 Healthy Spiralizer Cookbook– by Rockridge Press. 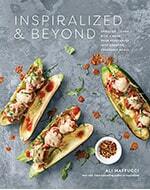 This trusty spiralizer cookbook will make it easier than ever to prep and enjoy 101 recipes for flavorful and good-for-you meals that are built around veggies. 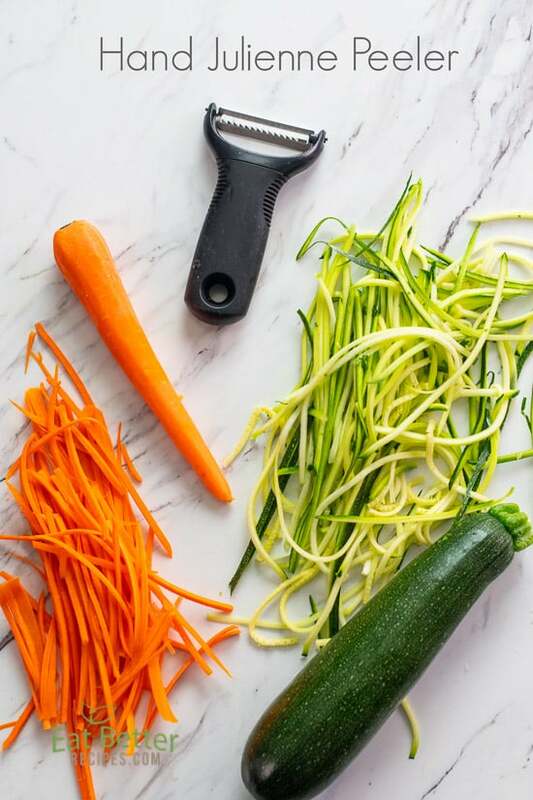 Using a simple zucchini spiralizer or a vegetable julienne peeler, this simple meal is just requires a few ingredients. This recipe can be adapted to any way that you want. Add shrimp, sausage, other proteins, sauces, tomatoes or more vegetables to make it perfect fit for your family and menu. 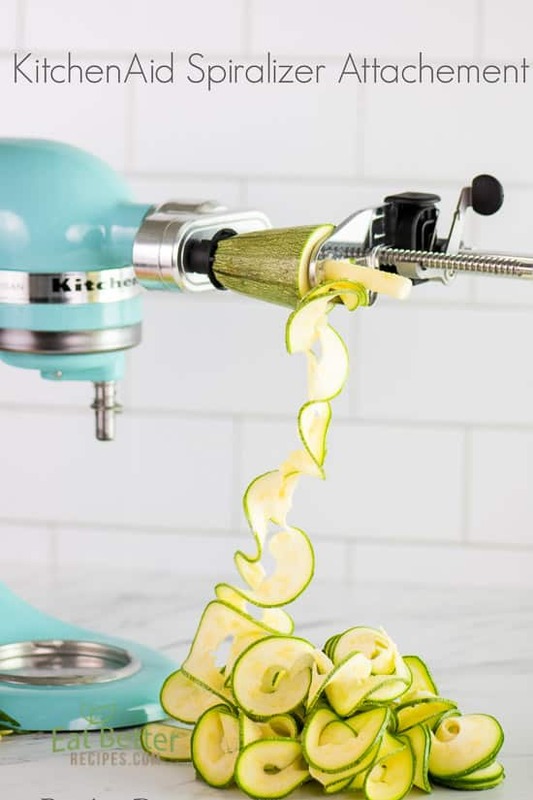 Using a spirializer tool, spiralize zucchini into spirals or noodle strands. Set zucchini noodles aside. Heat large pan on medium-high heat. Melt butter/oil, then add onion and garlic. Cook garlic until fragrant and translucent. Don't let the garlic burn. Add zucchini noodles and cook until tender, about 3-5 minutes. Zucchini noodles cook really fast, so taste a strand as you cook and decide how firm or "al-dente" you want the zucchini. Don't overcook the zucchini noodles or else they'll become mush. Add spinach and cook until spinach wilts. Remove the pan from the heat, add parmesan cheese and season generously with salt and pepper to taste. Add chili flakes then serve warm. Follow us on Instagram and Facebook and show us your pics by tagging #EatBetterRecipes We wanna see! I love having zucchini noodles as a regular part of my diet. This recipe in particular is EXCELLENT! Been looking for filling, keto-friendly dishes to make and this one hits the spot. Thanks for your easy instructions! This is definitely kept-friendly AND super delish. Glad you enjoyed it! 20 Minute Greek Salad that Everyone Loves!